The Indian Corn was dry enough to remove the kernels from the cobs, commonly called shelling. The corn was put through a hand cranked shelling device which removes the kernels. The kernel were then winnowed to remove the chaff. The kernels will be left to dry more in the shed prior to storage.Twelve pounds of kernels were obtained, which will be nixtamalized and made into tortillas and cereal. 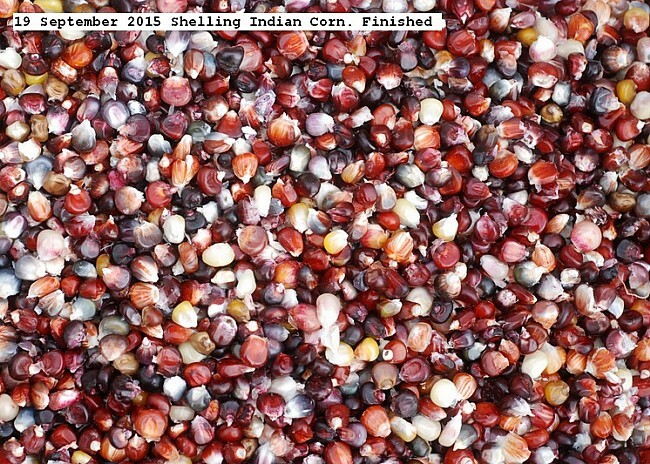 This entry was posted in Uncategorized and tagged 19 September 2015 Shelling Indian Corn, Shelling Indian Corn. Bookmark the permalink.